This was a game Newcastle should have won and would have won had it not been for goalkeeper Jack Butland who produced a string of magnificent saves to keep Newcastle at bay , especially in the second half , when he made terrific saves from Wijnaldum, Sissoko, Perez and then Lascelles from a goal-bound header after 86 minutes after the former Nottingham Forest player had come on for the injured Daryl Janmaat. But Newcastle still had the chances to have won this game rather comfortably and we were guilty of missing some chances as well as Jack Butland putting in a display that made him look like the best goalkeeper in the Premier League on this form. We needed a win today, but with our luck of late is such that it’s just good that Stoke didn’t break away and score a goal in the waning seconds of this game. The lads played well in both halves and kept the pressure on Stoke City, who at the end were pleased to get away with a point and were hanging on. The bad news is that late in the second half Daryl Janmaat picked up an injury after a poor tackle from Arnautovic, who looked like a loose cannon in the second half and surprisingly was not booked for that challenge. The game started off quickly as both sides were intent on attacking and it was end-to-end stuff early on and after 17 minutes a low left-wing cross beat Mbemba in the box and the ball went through to Walters who had an open goal but was late and the chance was missed. It looked like a sitter. Aleksandar Mitrovic hit the inside of the post after 28 minutes with a good header from a Sissoko left-wing cross and the ball then hit Butland – but no it didn’t go in – it was scrambled away. It was one of the few times in the match that Butland was beaten, but the post came to Stoke’s rescue. On 38 minutes there was a penalty appeal as Ayoze Perez seemed to be brought down in the box but the referee Roger East – who had a good game – waved play on. It was 0-0 at half time and Newcastle had put in a performance like last week at Sunderland, but Stoke were also attacking Newcastle in a good high tempo end to end game. On 47 minutes Ayoze Perez curled a shot only just wide of Butland’s left-hand post and then after 50 minutes it was Jack Butland who turned the ball over the crossbar from a good Wijnaldum free kick. Just three minutes later it was Perez who was going through the middle and he unleashed a shot that Butland did well to turn the ball for a corner – as Newcastle were surging forward and looking for the go-ahead goal. On 71 minutes McClaren made an attacking change as he brought on Siem de Jong for Cheick Tiote – who had a good game in the center of the park for Newcastle – and wasn’t even booked. And credit to Rob Elliot who made a great save from Walters, but then Daryl Janmaat seemed to pick up an injury from a wild Arnautovic challenge and the Dutchman was replaced by Jamaal Lascelles after 83 minutes. And Jamaal almost won it for Newcastle after 87 minutes when he powered in a great header on goal but Butland produced his best save of the game to somehow keep the ball out – as a number of Newcastle players had their head in their hands. Newcastle deserved to win this game – and this was a good performance and we certainly seem to be heading in the right direction. Now we need to ensure we win games like this in the future when we create a good number of chances and had six shots on target – the same number we had on target when we beat Norwich 6-2 in the last home game. But a point is better than nothing and there were a lot of positives to take out of this game – we just didn’t have any luck. One last point – this was our first clean sheet since the game at Manchester United on 22 August and the defense looked solid enough – we’ll now have to see how badly Daryl Janmaat is injured. Who Was Newcastle's Best Player Against Stoke? Newcastle: Elliot; Janmaat (Lascelles, 83), Mbemba, Coloccini, Dummett; Sissoko, Anita, Tiote (de Jong, 71), Wijnaldum; Perez, Mitrovic. Subs not used: Woodman, Haidara, Gouffran, Thauvin, Cisse. Stoke: Butland; Johnson, Shawcross, Pieters; Adam, Whelan; Shaqiri (Crouch, 90), Bojan (Afellay, 60), Arnautovic (van Ginkel, 88); Walters. Subs not used: Haugaard, Ireland, Wilson, Biram Diouf. Too often our play is absolute drivel. People have forgotten what a good team looks like. We’ve had patches of decent play in certain games but not nearly enough to be competitive in this league. Without huge intervention from Ashley we are going down. The defense is simply not good enough. Players like Dummett should be nowhere near first team football. Others should have been long gone years ago. Nothing has changed. Excuses are for losers I’m afraid. I’ve been sitting patiently waiting for you to open your mouth and put your foot in it. You haven’t let me down bless you. You talk complete and utter garbage and have done all season. 4 Dummett got skinned by Shaquiri ONCE and Anita (the player you mock for his height) covered him. 5 Which others should have been gone years ago ? I think you had your remarks ready to post before the game kicked off !!! It’s becoming too late. These needed to be done at the beginning of the season because these 3 games are the one we need to win. we’re still not scoring goals and we’re not defending well and in november the only home game is against leister who have just had another great come back from behind. Well that’s an assumption right there, I for one dislike Astley for the money he has starved this club of. I also live in Lancashire which means I don’t attend games, which means I don’t ‘line his pockets’. We won’t be in 18th place at the end of the season if we continue to play like this, we won’t get unlucky every game. pre season was spoiled by Carver booking a team holiday in the USA, that should never have happened, they should have been in Europe close to home. Shteve had no say in any of that.. I hope you’re right Llort mate. I think it will require big spending by Ashley in January as our injuries mount. We often struggle in the second half of the season so this will have to be a complete turnaround. Just like to say thank you to the ones that have sent me messages last night and today regarding my dads cancer, can’t thank you enough. Toonking that’s where you have been expecting too much. Did you honestly believe that we would be playing well straightway this season? Are you mad? Our football was shocking last season and we just got a new manager with new players that endured the worst pre season ever. What I’m starting to see is a team with a philosophy which is gelling and improving. This is a sign that we are going to continue to get better and that is why I’m not worried. The 2 views of things on here simply aren’t reconcilable. I look at things like number of wins, goal difference, and number of goals allowed as well as how we play. Based on the important stats we are an utter failure again. I don’t like it and I wish it weren’t true but that’s what the numbers and the position in the table tell us. Sorry to hear about your dad welshie. The rest of it on here is just leg pulling but cancer is serious. May he recover and live a full life. How much is your retainer Jeff ? Where are the 33pts we’ll almost certainly need for safety coming from ? Playing reasonably well is not enough. We need points. Okay luck may or may not average out over the season but I thought we were going to ‘make our own luck’ as Mr Ashley seems to think. We can only ‘make our own luck’ with a team who play well enough to win. catchy you didn’t as a nufc fan enjoy finishing 5th enough said! These are what have hurt us this season unfortunately, but not every game, we have been bad in a few. I agree with Catchy to an extent….the play seems to be better and we are getting more men forward on attacks. However we still create too few clear cut chances, we need to do a lot more. Butland did have a good game, but I don’t think he made any unbelievable saves, if he’d let any of those shots in you’d have been disappointed. The defence is still poor, concede a lot of chances and make mistakes. Elliott did well though, I think he is much better than many give credit for, especially as a 3rd choice keeper. I thought we played well today & deserved to win. 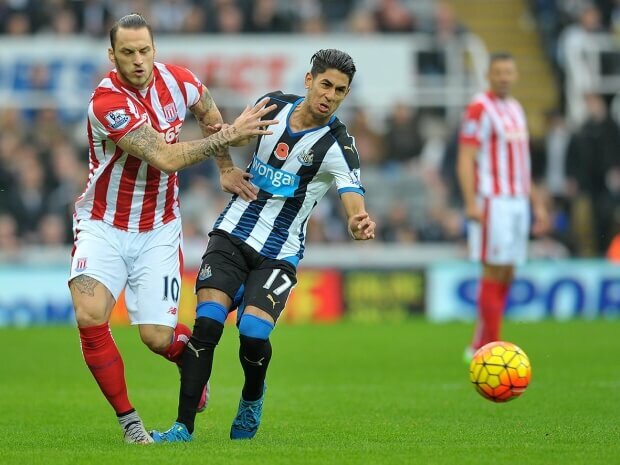 Perez & Mitrovic linked up well & were unlucky not to score. Even our defense was decent & only gave Stoke a couple good chances. If we keep playing like this the wins will come. So you would expect Butland to save Lascelles’s header? Wow, those are some high expectations right there. We did enough to win a game today, there keeper was just great on the day, we also hit the post. Our luck is crazy bad at the minute. the problem about a second half of the season is injuries start piling up and our squad is just not designed to cope with injuries. The second half of derby’s season went awfully wrong itself due to injuries. Well another chance gone begging. Wijnaldum is the difference to that team from last year. He is the difference for me not a massive change in football at this point in time like some seem to think. His pace and energy is exactly what we have been missing I think. He is a top player and has fitted in well with Sissoko and Perez great, they bounce and thrive off him well going forward, some nice link up play between them all. Crosses going into the box. If we lose Wijnaldum we will go straight back to square one I think. He is the player who is making things happen with them all I reckon. Amazing what a few signings can do, and how much it can affect moral and spirit for other players also. They need to do the best they can up until January and then bolster the squad further with proven quality, hopefully with players who can hit the ground running from this league. I really think if we lose Gini it would be a disaster. This is exactly what was expected of De Jong last season but he barely kicked a ball. Lots to think about from this. More to come from the Bournemouth match. Another big one. I said I thought we needed a minimum of 7 points from Norwich, Sunderland, Stoke, and Bournemouth. We have 4 from the first 3 of those so 7 is doable. But only just. could of won it – Butland MOM but we wasted to many chances by putting the ball to close to him to make the save. Also Elliot pulled of a blinder of a save at point blank range from Waters. Some clown must of watered the pitch after all the rain last night because players were slipping all-over the place and the ball seemed to hold up on the grass. Nice to see Tiote back looking like himself. My MOM can’t give one but the three best in my eyes were Tiote, anita and Dummett. There is no doubt McClaren has found a system that works and once again today we failed to win through luck rather than any inappropriate system. I said at the start of the game that the next 4 games would prove whether McClaren would remain in place. I personally think he should because the style of play is progressive unlike last season when it was painful to watch. Bournemouth next week then Leicester at home and Palace away? Not easy but I see us getting some points on the board.